It has been a very long week! At least - it has felt like it...with big deadlines at work.... Christmas shopping stress (I find shopping malls way too "peopley" even on a good day! ), and my hubby working day and night it seems like the weekend is gone with the blink of an eye and we begin another turn of the rat race again. I always use Sunday to recharge my batteries for the upcoming week...so today is going to be dedicated to spending quality time with my better half and catching up on a bit of R&R. Sundays are ALSO the beginning of our fabulous 2-week challenge over at Can You Case It! - our amazing Design Team members love seeing what crafty goodness you create with our challenges! 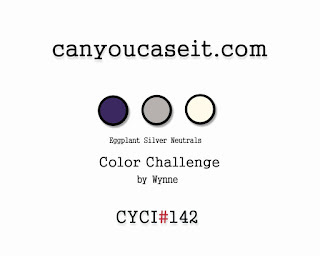 Here's another fantastic color challenge for you! I went a little crazy with the shimmer on this one (used some Glimmer Mist) and the snowflakes are from the Frosted Medallions set from SU! I pulled out a Unity Stamp set called Believe In The Magic for that awesome silver embossed sentiment. That purple cardstock just SHINES! Check out the other Design Team cards for inspiration and link your beautiful creation to our challenge! Very striking! I love the background and the touch of vellum! What an awesome card! Love all the shine in the background and all the little embellishments! Beautiful card! I love the sentiment stamped on vellum!!! Awwww, Crystal you are so sweet!!! Thanks so much! Love the beautiful and detailed medallion stamp. Beautiful!